…Anyway, between tricks and giggles, I got to chatting to the brides and grooms and I noticed something alarming. 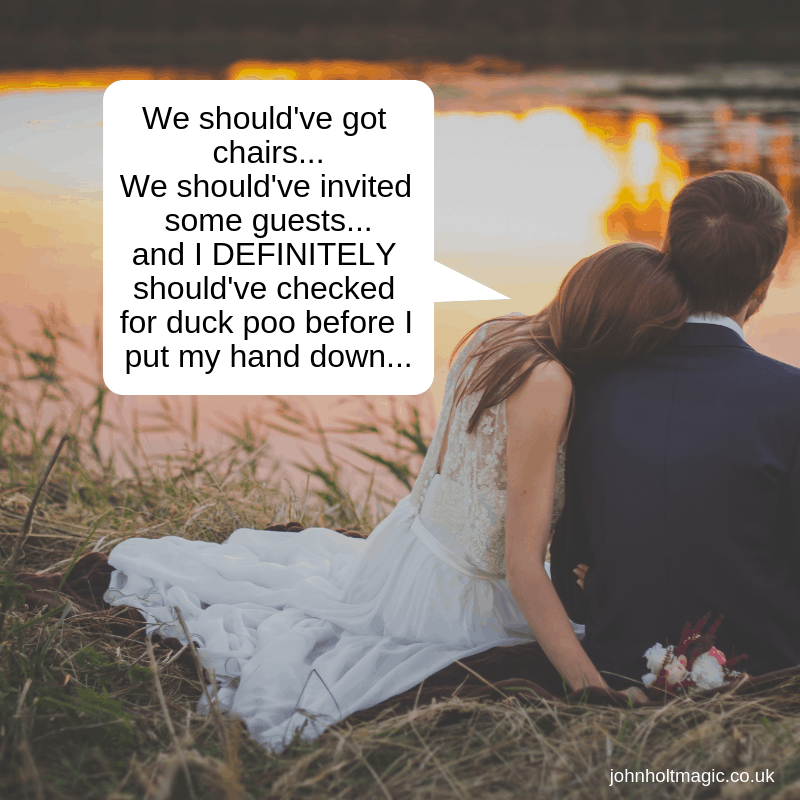 More than half of the couples I spoke to had booked something that they didn’t actually want at their wedding. Investigating further (I’m in full Columbo mode now! ), it turns out that they’d booked it either as a compromise to appease a family member or because they felt that they SHOULD book it. The word SHOULD always scares me. Especially when it’s used when planning your dream wedding. It made me realise that, even though weddings are now more liberal affairs than ever (you can even get married in B&Q for crying out loud! ), the pressure to conform to someone’s ideals is still there. It may be a pushy family member, a culture, society or that Instagram influencer you really like prodding you but, despite all the perfectly acceptable, legal and decent options, we’re still hearing the word “SHOULD”. As a wedding magician, I often hear brides and grooms ask me to perform during the wedding breakfast. Maybe they’ve seen a handsome chap doing magic tricks at a corporate event around the tables and just assume this is all we do. Don’t get me wrong, I CAN do this, but, in my opinion, I’m far more useful elsewhere. When I explain that I can keep their guests happy during the photo period, for example, there’s always a little surprise. One of the best things about magic is that it’s versatile – it can be performed pretty much anywhere, but that’s not just true about magic; a lot of elements that will go to making your wedding day special are able to be tailored to suit you, rather than the shoulds. There’s no SHOULDs, because, on your wedding day, it should all be about YOU.